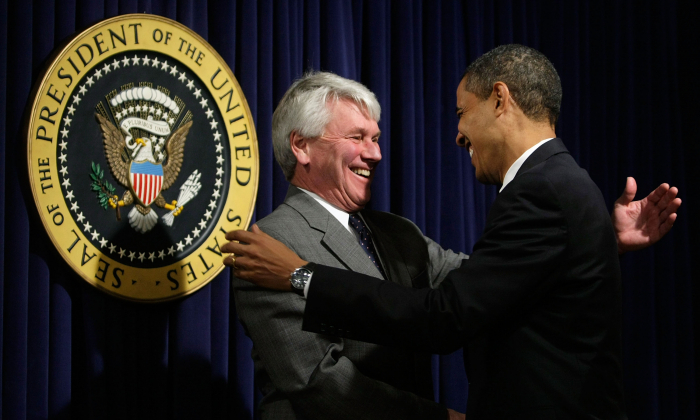 Former President Barack Obama’s White House counsel Greg Craig expects to be indicted for violating foreign lobbying laws, according to his lawyers. Craig has long been rumored to be the subject of a federal investigation spun off from the special counsel probe by Robert Mueller. Craig was pulled into Mueller’s net as part of the special counsel’s scrutiny of veteran political operative Paul Manafort and his work on behalf of Ukrainian politicians. Manafort was sentenced to seven-and-a-half years in prison for illicit foreign lobbying and other crimes in March. Craig’s former law firm has already paid more than $4.6 million and acknowledged that it failed to register as a foreign agent for Ukraine. The civil settlement with the firm, Skadden, Arps, Slate, Meagher & Flom LLP, laid much of the blame for the violation on Craig. “Mr. Craig is not guilty of any charge and the government’s stubborn insistence on prosecuting Mr. Craig is a misguided abuse of prosecutorial discretion,” the attorneys, William Taylor and William Murphy, said in a statement on April 10. The probe into Craig comes as the Justice Department is reportedly cracking down on violations of the Foreign Agents Registration Act, a decades-old law meant to allow Americans to know when foreign entities are trying to influence public opinion or policymakers. Craig’s attorneys said they expected to be charged by the federal attorney’s office in Washington at the request of the Justice Department’s national security division. Craig was the first White House counsel to former President Barack Obama. In private practice, his clients have included former North Carolina Sen. John Edwards and James Cartwright, the former vice chairman of the Joint Chiefs of Staff, who was investigated and charged for leaking classified information. The work in question in Craig’s case is tied to another successful prosecution by the special counsel’s office. Early last year, Alex van der Zwaan pleaded guilty to making false statements to the special counsel in relation to his work for Craig and Skadden. He wrote a report on the prosecution of Yulia Tymoshenko, a former Ukrainian prime minister. Tymoshenko was a political opponent of then-Ukrainian President Viktor Yanukovych, who was a longtime Manafort patron. Craig was not named in the statement of offense (pdf). Skadden was referred to as “Law Firm A.” Van der Zwaan, a Belgian-born Dutch national, was sentenced to 30 days in prison in April last year. In its settlement earlier this year, the Skadden firm acknowledged it had participated in a public relations campaign for the report and should have registered under the Foreign Agents Registration Act, or FARA, because of it. The firm also acknowledged it had been paid $4.6 million for the report and not just $12,000, as the Ukrainian government had said at the time. In the statement on April 11, Craig’s lawyers denied that he lied to the government or his firm. They acknowledged that Craig spoke to reporters about the report but denied it was part of a public relations campaign that would run afoul of FARA. The special counsel investigation concluded that neither President Donald Trump nor anyone in his campaign colluded with Russia. Attorney General William Barr is expected to release Mueller’s final report within a week.